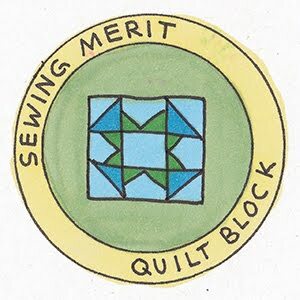 I joined in a quilt-along this summer and I actually completed all the lessons on time...well almost all of them. I got to the very last border, a simple strip of Kona white and I just stopped working on it. I had an obligation to finish another quilt project so I put it down. When I put things down the momentum to finish just disappears. With craft fair season and the holiday season coming, I had plenty of good arguments for putting this one aside. So now I have to admit that I am proud of myself. Here it is, just three days after Christmas and I finished it! I put the last border on, made the backing piece and quilted it on Thursday. I finished binding it yesterday afternoon, so really I finished it in two days but I didn't photograph it until today. Oh crap! It doesn't have a label yet so I guess I am not quite finished after all. Gotta keep that momentum going. Back in the early 90s I went to ceramics class with a co-worker and her mother and sister. 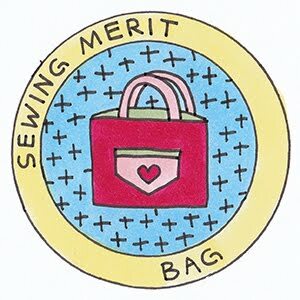 Over a course of a few years we had a great time making lots of adorable things. Of course over the years as tastes and styles change, many of those things we made are long gone. The one thing that I did make that had stood the test of time is these pencil Santas, as they were called. I flipped them over to see that I carved the year, 1992 into the bottom of them. To reflect the current times, last year I made a garland out of felt balls. This year I thought I would string them up again but I found that they were all tangled up and I didn't have the patience to untangle them. So here they are, surrounding the pencil Santas. Let's just call that an upgrade into the new millenium! I still love to put them out every Christmas season. I purchased a 10-degree ruler earlier this year for some fun projects. I thought I would try it out by making a Christmas tree skirt for my skinny tree. It didn't need to be very large, just large enough to cover the base of the artificial tree. The ruler can cut pieces up to 25 1/2 inches long. I used up my scraps leftover from last year and the trick was getting directional pieces cut so that they were not upside-down. That meant there would be some waste...or so I thought. I didn't use any instructions, I just decided to start at the top of the ruler and make the strips 20 inches long. They were going to be skinny strips, perfect for the skinny tree. I didn't do any math, I just decided to start cutting. So I cut 4 pieces of 6 different fabric then commenced to sewing them together using the same order with each set of 6 strips. Once the 4 sections were completed I realized I needed quite a few more strips; 12 to be exact. I started cutting more and that's when I ran into a little trouble. Either I would have to cut some directional strips upside down, or use different fabric altogether. I chose to do both. I think that made it a little more scrappy looking in the end. After I sewed them together I got out some strips of batting left over from bigger projects. This is one instance where I don't mind sewing two strips of batting together to make a large enough piece. 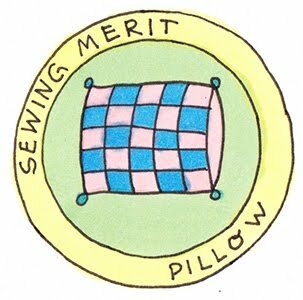 Unlike a quilt, there won't be much snuggling with a tree skirt, so I don't see the necessity of using a single piece of batting. No one will ever notice. Using a square piece of red Kona for the backing, I pinned the top, batting and backing together. 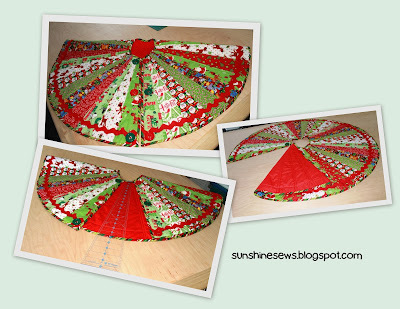 I do not cut the tree skirt shape out when I get to adding on the backing, I just leave it whole and quilt it. After the quilting is completed, I then cut away the backing. I used a striped fabric for the binding and added some large red and green buttons. The trick is using small rubber bands to hook the buttons together once it is place around the tree. I also added 3 yards of large red rick-rack around the bottom for added decoration. Now it's under the tree just in time for Christmas. I used Sweetwater's Birthday Bag pattern to make a Christmas version of their bag. The Sweetwater pattern came with some premade labels so I stole that idea and printed up some of my own that said Merry Christmas. The Christmas prints are so bright and cheery and once the bags were completed, they seemed like a perfect fit for my granddaughter, Chloe's teachers. She has two teachers who attend to her class and two teachers' aides as well. So of course, I had to make four bags. I bought the most adorable coffee mugs and filled them with cappuccino mix and some Godiva chocolates which fit perfectly in the quilted bags. Then I attached a tag I printed off the internet and hand-wrote Chloe's name on each tag. I sure hope they like them, they are all so wonderful. 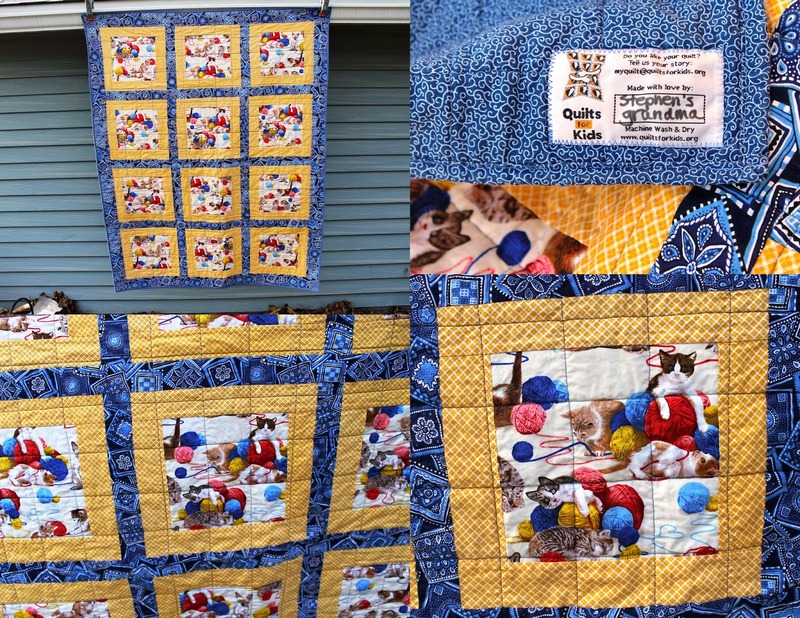 My church group, the Sweet Sundays Quilters made some lap quilts for wheelchair patients over the last few months. And it just so happens that every December my American Legion Riders motorcycle group takes a trip to the VA Hospital in Milwaukee to specifically visit the Spinal Cord Injury unit of the hospital. We take with us handmade Christmas cards that were given to us by local elementary school children. The cards are adorable, most say "Thank you for your Service" and "Merry Christmas" in the most eloquently misspelled ways that define cuteness. You can feel the love in those cards. And what a perfect place for me to take the church group's handiwork. I have made it a tradition to purchase Hershey's Hugs and Kisses and make little sacks wrapped in red and green tulle and tied with a ribbon. There's nothing like chocolate to make someone's day. Our group spent Wednesday evening visiting with these wonderful people and giving out our goodies in a gesture of good cheer. I took a few photos of those who would allow it. They were thrilled to get the quilts and we were so happy to spend some time with folks who had so many amazing stories to tell about their vast experiences travelling the world while in the military. Bailee was excited to join me at a Quilts for Kids meeting a few months back and she grabbed a quilt kit and started working on it. 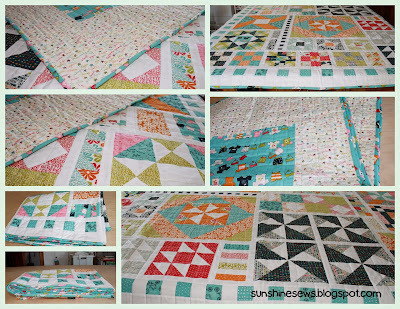 She completed the entire quilt top using the rail fence pattern and got the binding done in two meetings. After that, she struggled to find time to finish it. 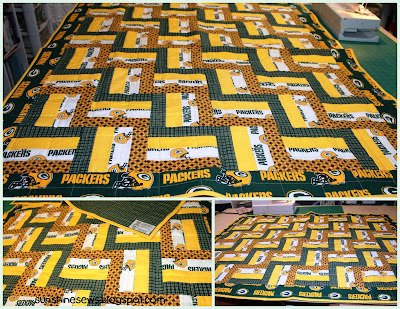 Luckily, I have lots of decent sized pieces of batting so I told her I would put the layers together and quilt it for her. I was on a roll, I pinned the layers together and completed the quilting in one evening. Since I got it done so fast, I also attached the binding she made. Quilts for Kids requires machine sewn binding and even though I usually hand-sew the binding on, I am getting used to how quickly I can finish a quilt by machine sewing it on. So it's done and we have another one to take to the next meeting - YAY! 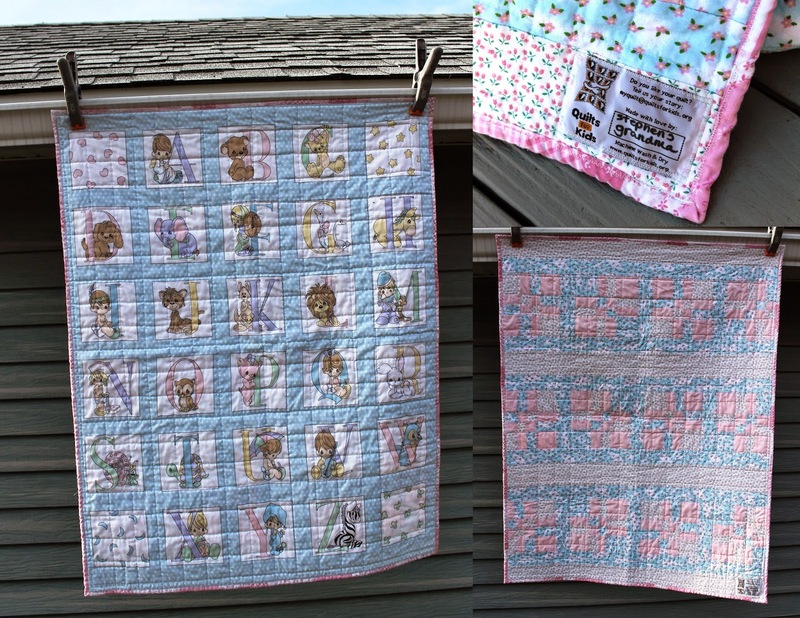 I took a Precious Moments fabric panel from the donated fabrics at one of our Quilts for Kids meetings. Since it is so pretty "as is" I thought I would do something a little more interesting on the back. I grabbed some fabrics that would match and some pink Kona from my stash and made some 9-patch blocks. I then cut them into quarters to make disappearing 9-patch blocks. I got 12 blocks out of the fabrics. I added a few strips of the leftovers from the 9-patches to fill in between the rows. 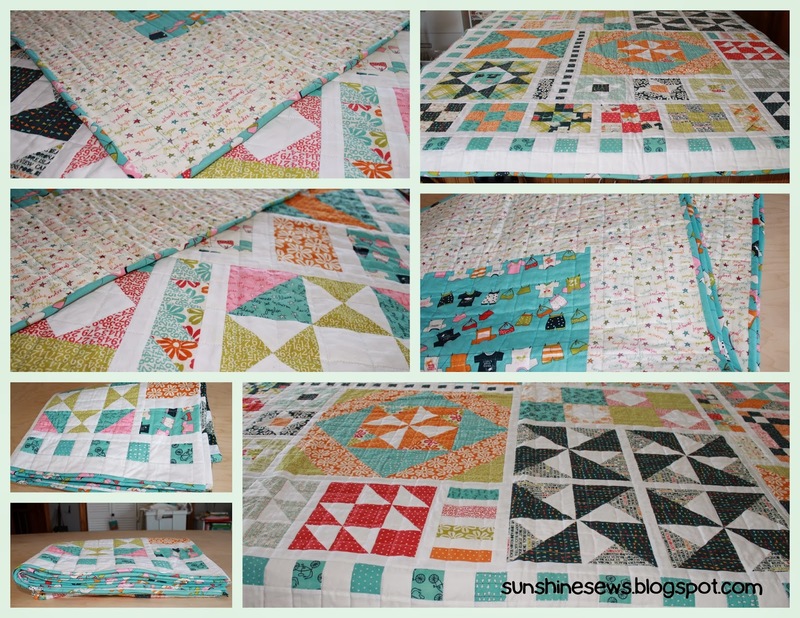 It's straight-line quilted to accent the pretty alphabet blocks. I have so much fun making these for Quilts for Kids. 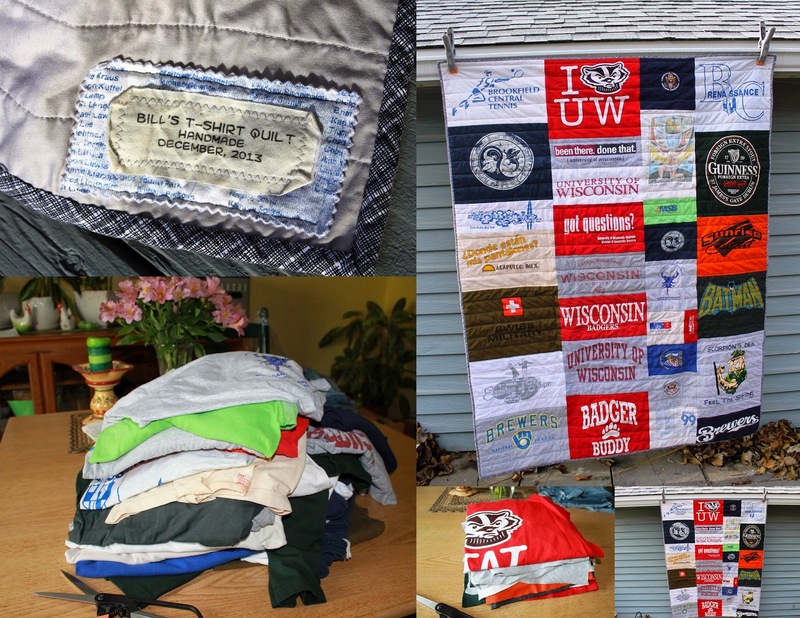 I finally completed this t-shirt quilt. I had the most difficult time working on this project because it's for someone else. The whole responsibility of cutting up someone else's shirts was a little intimidating. I had such a fear of making a mistake that it took me a lot of planning to even get started. When I did start, I cut all the shirt logos out with the maximum fabric allowed to be sure to have plenty to work with. Then I backed all the pieces with Pellon 911F, a heavy duty iron-on stabilizer. After that I was stuck on where to begin to start placement. So I grouped the shirts by subjects. That didn't quite work. Then I spread them out to try to vary the colors to get variety. That didn't work very well either. Unfortunately, some of these shirts were pretty worn. Working around that was a little challenging. I stacked, sorted, restacked and laid out these "block" over and over without getting anywhere. 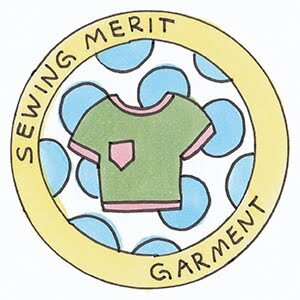 For inspiration I googled the subject and searched for photos of completed t-shirt quilts. Some were framed in fabric, which I did not want to do because I had so many shirts. That idea would only work if I had maybe 12 shirts but I had a lot more than that (30 to be exact). So I knew I wanted to stitch the shirts together somehow. I started looking at tutorials and finally found the right one. The tutorial I used was more about making calculations than anything else so I followed the directions to a tee (no pun intended). As is turns out, the secret was making columns of blocks and I was trying to make rows. All I had to do was measure the width of each logo, then sort the blocks by that width. Obviously since I cut them a lot larger, maximizing the amount of fabric available around each logo, that gave me lots of wiggle room. I ended up with 4 piles, one with 16-inch widths, one with 14-inch widths, one with 10 to 12-inch widths and one that had 8-inch widths. Then from each pile I determined with block had the least amount of width of fabric around it, squared it up, then cut all the rest the same width, leaving lots of length to work around after the columns are sewn together. After I went through that process with all the piles, I had 4 very neat columns of quilt blocks. Now for the fun part, I laid them out in 4 rows. Amazingly, some of the subject matter fell in groups - I had an entire column of UW-Madison blocks! In retrospect, that makes sense since the words, University of Wisconsin Badgers or University of Wisconsin Madison, had lots of letters in them. I rearranged each column into categories/colors to compliment the neighboring columns. It was going together like a jigsaw puzzle, each piece seem to fit naturally. That is until I got to the smallest column. I bent the rules here. I turned some of the squares sideways to make them fit nicely and I actually pieced a block with sections from the same shirt, cutting away the worn parts and then putting the rest back together. I thought that was important because the graphic on this shirt contained the owner's name. 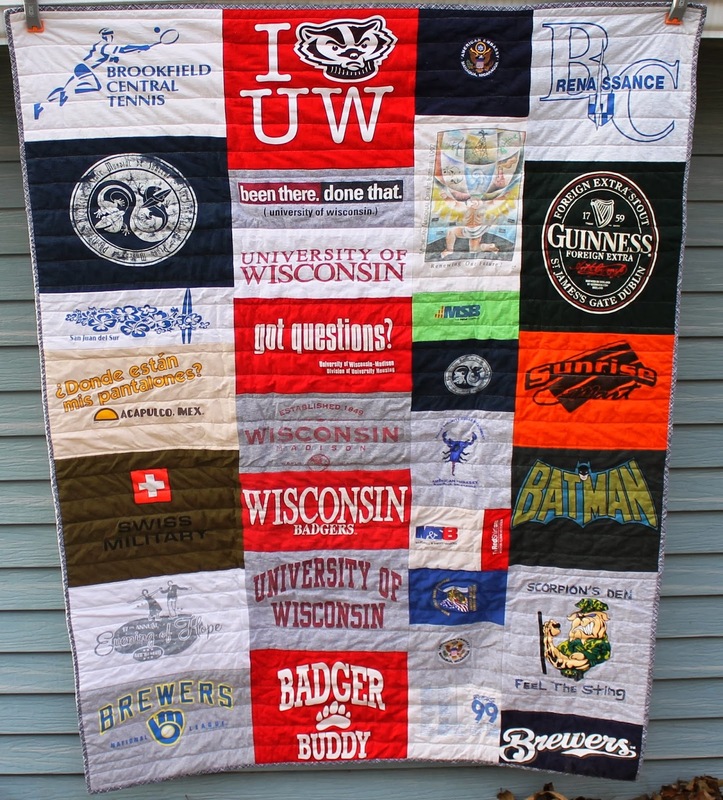 I really wanted that incorporated in the quilt no matter how many holes I had to work around! Once laid out, it was easy to adjust the lengths of the blocks by cutting off some of the extra fabric I left in each block. So away I went, stitching the columns together. Unfortunately I ran into another snag. My machine broke down. Here I was ready with my new ball-point needle designed for jersey knit fabrics and I couldn't sew. I took machine in for repair. I was so excited that I was finally going to get this thing together and I lost a week to the repair shop. Once back, I started stitching. Then the bobbin winder on my machine broke. I felt defeated and started to wonder. Should I be looking at a new machine? After all, mine is over 20 years old and this will be the third time the machine is in the shop over the course of this summer and fall. I started looking and picked out a new one that I liked. As I got ready to put a deal together I got a case of buyer's remorse. I love when that happens BEFORE spending $4K instead of after. So I got my old girl fixed again and as it turns out it was very minor so she should be humming along for a very long time now. Once the top was finally done, I had to choose the backing fabric. I knew I wanted it to be gray but I didn't realize how hard it would be to find that color. Most fabric stores were out of gray and the ones who did have it didn't have the necessary 3 and a half yards that I needed. After a few weeks of searching/waiting for sales I picked up the backing. This darn quilt is taking forever. I feel terrible. I finally layered the quilt, batting and backing together and did some straight line quilting on it. I made the stitching in rows 2 inches apart. I originally wanted to put them closer together but the stretchiness of the t-shirt knit made it impossible without a lot of stretchy puckers. After a few rows of quilting, I decided it looked OK with the 2 inch gaps. Another problem occurred. Some of this fabric was worn pretty thin, a sign of a very loved shirt. I thought by backing it all with the heavy duty 911F I would be saving the fabric from more wear. 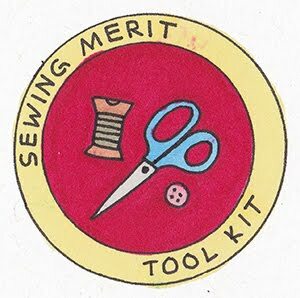 However, from stretching it to pin the layers together, some of the fabric split into a tiny little hole right in the center of the quilt. Taking this thing apart to fix it would have been an enormous job. After consulting with quilty friends, we decided to mend the hole later. Once the quilt was done and the mending was finished, I picked out some awesome fabric for the bias binding and quickly attached it and completed the finish work. I added a label with a rustic look, to match the worn shirts. I popped the quilt in the wash machine and my machine had a little trouble with the weight of all those heavy quilt blocks from all those t-shirts. It's like the spin cycle could not wring out all the water so I wrung it out by hand before putting it in the dryer. And now after a 5-month journey of worry, stress, and 3 trips to the shop for machine repairs, it's finally done. And even after all that, I've waited a few days to get ready to deliver it because today is the first day the sun is shining for a photo opportunity - insert heavy sigh here. This project gave me more confidence (block assembly calculations) and a new skill (working with jersey knits in the quilting process) and I really did have fun learning and completing the project. I sure hope Bill thinks it was worth the wait. This quilt was so fun to make because I did not use a pattern. I love when that works in my favor. I fussy cut the kitty squares then just framed them with strips of gold fabric. I then put them on the design wall and decided to make 4 rows of three blocks framed in blue fabric strips with a border of the same fabric. And viola! Very simple.Very quick. Love the color combinations because it was constructed entirely out of donated fabrics. Sometimes that can be a challenge since usually fabrics can be coordinated easily but not always is there enough yardage so it is a bonus when it all works out. I decided to use variegated blue thread to machine quilt this giving it a picture window effect. Normally dark thread would be a bad idea on light fabric but I thought it gave the whole quilt an interesting look. I hope whoever receives it likes it too.